Organic, GMO, pesticide-free, fair-trade -- what do these really mean, are they just trends and how do they affect our planet? Agriculture is a complex industry which to some extent we are all reliant upon. Understandably, for decades the focus has been on how to increase crop yield more efficiently and cheaper. At first glance, this seems intuitive. And in large measures the agricultural industry has been able to accomplish this through the widespread use of pesticides and genetically modified crops that are resistant to pests and other external factors. But does more equal better? The evidence suggests not. We have sacrificed nutrition for quantity, and we are now ingesting chemicals into our bodies that we were never meant to. In 1974 Monsanto patented glyphosate as an herbicide, aka Roundup, which revolutionized farming practices and as such the use of the herbicide has grown exponentially. This has had not only a profound impact on the food we eat, but also on all the natural support systems that affect all life. The pervasive use of glyphosate has given rise to "superweeds," more resistant weeds that have evolved in response to the herbicide, resulting in ever larger doses of the chemical being sprayed. Herbicides and pesticides leave residuals on crops, affecting the genetic makeup of the plants, their nutrition, as well as consumption by humans. A 2014 study by the Arctic University of Norway conducted in Iowa found high levels of Roundup on 70 percent of genetically engineered soy plants. This increase of glyphosate and other chemicals in humans is leading us to numerous health hazards. As far as 30 years ago, glyphosate has been evaluated by the EPA for its potential to cause cancer. In an original study done with mice, the EPA found that the chemical may have cancer causing potential, but reversed their decision only six years later in 1991. However, the International Agency for Research on Cancer, an agency of the World Health Organization, recently declared that glyphosate "probably" causes cancer, drawing from several previous studies on people, animals and cells. Industry leaders, like Monsanto, oppose the decision, citing agendas and cherry-picking of data. The EPA's initial reversal, as well as the controversy surrounding the W.H.O. 's declaration, demonstrates the variance of conclusions reached by how each agency analyzes the same data. Although we are still waiting for the W.H.O. 's detailed monograph on how they reached their conclusions, what is clear is that glyphosate deserves a second look. As the most widely used herbicide in the world we cannot afford to take risks and ignore the potential harm. But what about the plants themselves? GMO crops, as well as those excessively treated with herbicides and pesticides, have an altered genetic makeup that may severely deplete their nutritional value. One way we are seeing this is in the impact on the quality of soil, which not only affects nutrition but yield. According to the New York Times article "Misgivings About How a Weed Killer Affects the Soil," Robert Kremer, a scientist at the United States Agriculture Department, says "Because glyphosate moves into the soil from the plant, it seems to affect the rhizosphere, the ecology around the root zone, which in turn can affect plant health." To ward off disease and improve photosynthesis, plants' root systems depend on a complex system of bacteria, fungi and minerals in the soil. 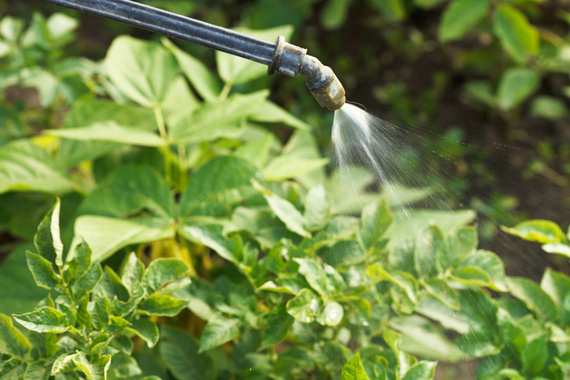 Roundup in the soil can actually compete with plants for these nutrients and in some cases change the makeup of bacteria and fungi in the soil, making them more susceptible to pests and pathogens. Simply put, chemicals that are put on soil affect and alter the chemistry and biology of the land, which affects the biology of the crops, which affects the biology of the humans consuming these crops. A clear example of this is colony collapse disorder, the name given to the ongoing mass die off of our pollinators, primarily bees, but butterflies and other insects as well. Pollinators are responsible for one-third of the food we eat, and this includes some of our most nutritious food, like fruits and vegetables. Although studies are still trying to determine the exact nature of the relationship between colony collapse and pesticides, the relatively new neonicotinoids insecticides are thought to be a primary culprit. Honeybee pollination is a major economic engine, according to the Agriculture and Consumer Protection Department of the Food and Agriculture Organization of the United Nations, the worth of global crops with honeybee's pollination was estimated to be close to $200 billion in 2005. As global citizens of the world, we can not afford to keep living with our heads in the sand about pesticides and GMO foods. What can you do? Each time you choose the organic product at the grocery store your dollars are voting against these destructive practices. Whether you choose to buy organic or not, let your grocer know you want food labelling. You can also empower yourself with the Environmental Working Group's recently launched food scores database. This is a definitive guide that rates food based on nutrition, ingredient and processing scores.You can shop at local markets and refuse to purchase plants treated with neonicotinoids. Also check out these organizations that are doing amazing work -- Xerces Society, Pesticide Action Network, Friends of the Earth and Center for Food Safety.